Venue: SMBC Academia Hall, 4F, International Academic Research Bldg. -Apply, collaborate internationally and go to New York! 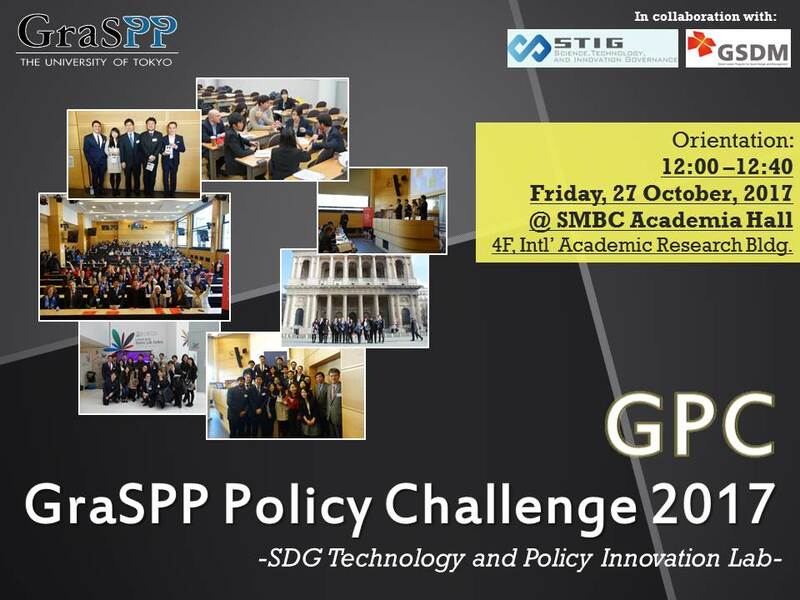 GraSPP Policy Challenge(GPC) is a new initiative at GraSPP, in which Japanese and international students collaborate and seek to improve their team-building and policy-making skills. Participants are tasked with responding to pressing real-world policy challenges as a group, and with designing policies and proposals in response to those challenges. All students are strongly encouraged to apply. If you passed the first screening you will be able to register this initiative as a Case Study course in A2 term. Finalist groups will be ultimately invited to present at the GPPN Student Conference* at Columbia University, New York in February 2018. For more information, please attend the ORIENTATION on Oct.27. *GraSPP is a part of the Global Public Policy Network (GPPN) and delegates its students to the GPPN Student Conference every year. In February 2018, GPPN Student Conference will take place at Columbia University, New York. This year, it is proposed that the GPPN partners and their student groups undertake a “SDG Technology and Policy Innovation Lab.” The purpose of this lab would be to mobilize student intelligence to develop creative technology and policy solutions to challenges around the UN Sustainable Development Goals (SDGs). Students would be invited to produce either short applied concept papers or applied projects.